For most golfers, the closer the golf ball is to the hole, the easier it is to make the putt. Makes sense, right? Well, for some golfers, when they get within two to three feet of the hole, their chances of making the putts actually goes down. If you stand over a two-footer and are less confident than you would be for a five-footer, you might suffer from the Short Putt Zone of Doom! The image below is a rough approximation of the percentage of putts made by pros and amateurs at various distances (don’t hold me to those numbers). 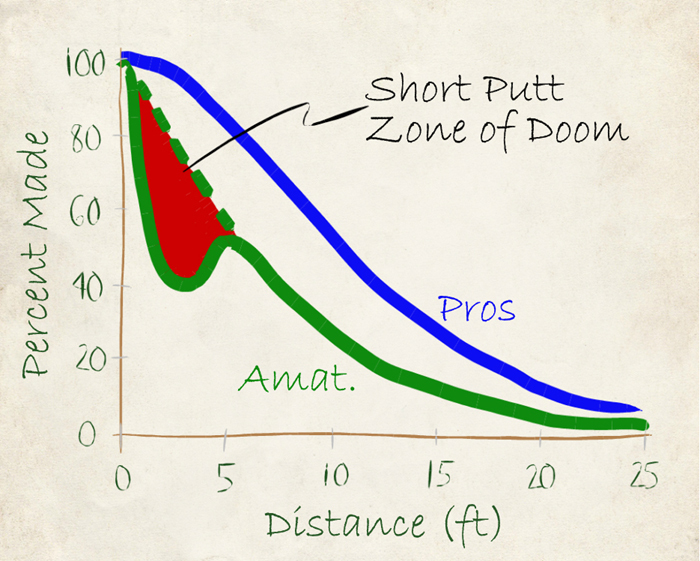 We’ve talked to many amateurs who can drain more putts from four feet than they can from two feet. How is that possible? If we were putting robots, it would make sense that we’d make a higher percentage of putts from two feet than four feet – but we’re humans with human emotions and reactions and fears. When we compare the putting strokes from these short-putt-challenged amateurs at various distances, we can see that there’s a pronounced rhythm or tempo change when they get close to the hole. I don’t want to get into the semantics of tempo vs. rhythm but every putting stroke regardless of distance should have the same tempo/rhythm. Golfers who miss these short putts lose their rhythm — they tend to have much quicker, short back strokes and much quicker, jabby forward strokes. There’s no sense of rhythm. It gets quick. It gets jabby. And there’s no smooth follow-thru. Think of your putting stroke as a metronome with the arm swinging back and forth. Whether your stroke is a quick “tick-tock” (back-thru) or a slower, more relaxed “t i c k – t o c k”, it should be the same for a 20-footer as it is for a 2-footer. As you practice putting, get a musical feel in your mind about what your normal putting stroke rhythm is – your “t i c k – t 0 c k” pace. Then practice putts from four feet and closer while maintaining that same rhythm. Even on the really short putts that you might consider to be gimmes, stay focused and maintain that rhythm. And, very importantly, have a smooth, consistent follow-thru on your forward stroke – almost as if you continue to chase the ball with the putter head. What Else Might Be Going On? Another problem we see on these short putts is that golfers will take a quick look at the hole after striking the ball which causes their bodies to move with their heads. As with all putts, you should keep your eyes and head fixed on the starting position until well after the ball has left the putter face. Ideally, on these short putts, you should keep your head still and eyes focused until you hear the ball rattling inside the cup. And finally, since these putts from short distances might seem like gimmes, golfers sometimes don’t take them seriously and don’t give them the attention they deserve. So treat them like a ten-footer, get focused and putt with purpose and rhythm. Please let us know how you’re doing.